Memorable Wedding: Autumn Wedding Decoration - The Top 8 Ways to Incorporate the Lovely Fall Colors on Your Big Day! Autumn Wedding Decoration - The Top 8 Ways to Incorporate the Lovely Fall Colors on Your Big Day! Are you getting married during the summer, winter, spring or fall? Those who are saying their "I do's" during the autumn will surely have a blast decorating, because there are a lot of lovely fall colors to choose from. Autumn is the time of the year where gold, red and orange leaves prettify the surroundings. The climate during the fall is great, too - which is the reason why more and more couples are choosing autumn as their wedding date. The first thing that you need to think about if you are having a wedding during the fall is the color scheme that you are going to use. You can actually take your pick from a variety of shades between oranges, reds, rust, burgundy, gold, browns and yellows. Fruits, blooms and leaves can also be incorporated in your autumn wedding decoration. Just let your imagination run wild and you will surely come up with great ideas on how you can use the lovely colors of fall while decorating the venue of the wedding ceremony and reception. 1. Use gold-colored place cards which are decorated with an image of a maple leaf. You can actually create the place cards yourself, or go online and look for wedding specialty shops which sell autumn-themed place cards. 2. For the table centerpieces, you can be as elaborate or as simple as you want. One great idea for your autumn wedding decoration is to use a bowl of water as a centerpiece. You can place an organza ribbon inside the bowl, and finish off the look with two to three gold maple leaf-shaped floating candles. 3. The classic flower arrangement as a centerpiece never fails to impress. However, you can add an autumn twist to the typical floral arrangement by using the season's most beautiful blooms. 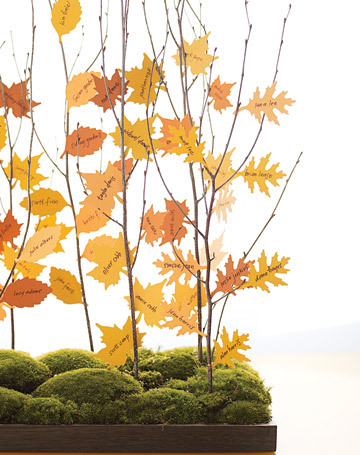 Use this in combination with tea lights that reflect the fall colors and you can have a breathtaking centerpiece. 4. Don't limit your autumn wedding decoration ideas to flowers and candles, fruits and leaves are also a perfect reflection of the season. For example, the bottom of your unity candle can be decorated with an elaborate arrangement of grape clusters, acorns, cornucopias or maple leaves. You can use the same mouth-watering arrangement on the buffet and cake table. 5. 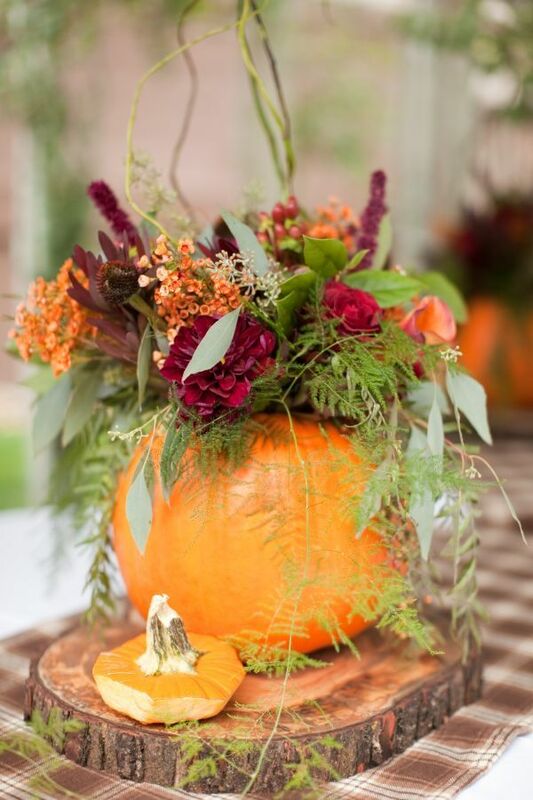 For a unique centerpiece or buffet table decoration, you can hollow out a pumpkin and decorate it with an arrangement of lovely blooms like zinnia, black-eyed Susans and tiny sunflowers. 6. If you already have an outdoor wedding ceremony and reception, you can just highlight the natural beauty of the surroundings and blend your autumn wedding decorations in. Use white fairy lights to decorate trees and bushes. Not only will they light up the place but they will also add a dream like atmosphere to your wedding. 7. Clusters of grapes, apples and similar arrangements which use the fruits associated with the autumn season can be added in strategic places to further improve the decorations. One good idea is to use grapevine swags instead of fabric to decorate entrance ways. 8. The wedding favors should also reflect the autumn theme. Consider giving out candles with maple leaf designs, maple leaf key chains, sunflower-shaped soaps tied in tulle fabric. There is practically no end to the ideas that you can use for your autumn wedding decoration. Have fun in decorating, and remember that the only rule is for you to use the lovely colors that reflect the wonderful autumn season.